Blue Cheese is truly the gateway fromage. 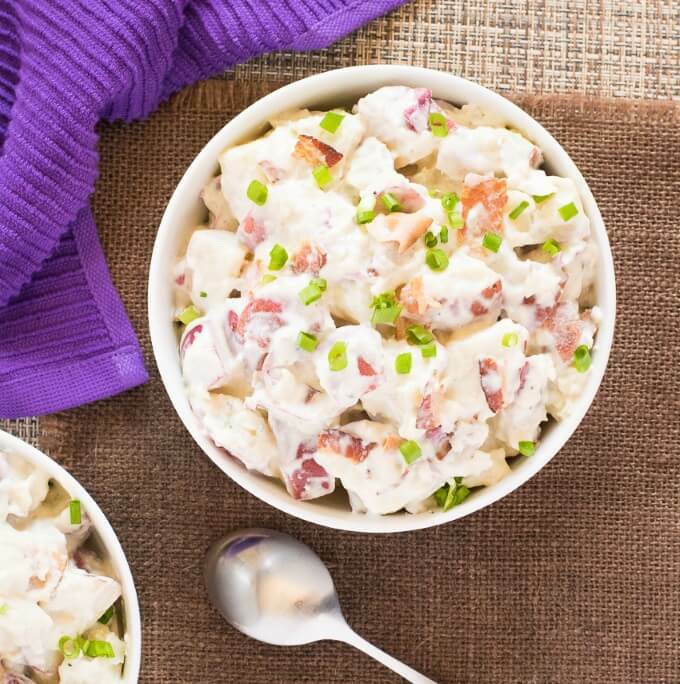 This Blue Cheese Potato Salad with Bacon is likely not a picnic offering your culinarily unadventurous friends would approve of since the pungent blue cheese permeates every bite. For them, I recommend my creamy red potato salad. However, for those of us who desire to delve into the darker depths of flavor, each smoky bite is pure nirvana! 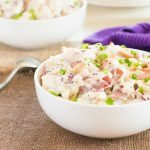 While blue cheese serves as the primary flavor agent, smoky bits of bacon carries its deep flavor throughout the potato salad while a splash of vinegar and chopped green onion provide a counterbalance of brighter flavors. It is creamy, pungent, and completely intoxicating! Boiling chopped red potatoes for 10 minutes should leave them sufficiently tender for potato salad. They are done cooking when they can be easily pierced with a fork. When the potatoes have finished boiling, it is important to cool them down before tossing them with the remaining ingredients so the heat from the potatoes doesn’t cook your potato salad. Rinsing them under cold water works well. You will notice whenever I call for boiling potatoes, I always recommend adding a splash of vinegar to the boiling water. Vinegar helps prevent the potatoes from overcooking and falling apart. Even if cooked a few extra minutes, potatoes boiling in vinegar-infused water hold their shape longer, while maintaining a pleasing texture. Vinegar also tastes great in potato salad, so it is a natural fit in this recipe anyhow. 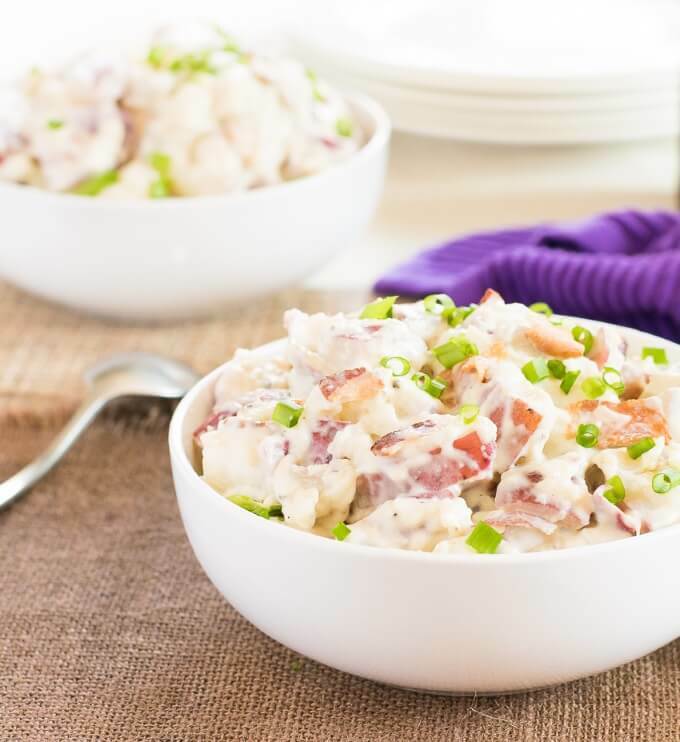 If you’re bringing this Blue Cheese Potato Salad with Bacon, or any other potato saladd to a hot summer picnic, keep in mind the dairy-based sauce cannot sit in warm weather for extended periods of time before it is unsafe to eat (four hours or less). I recommend keeping a serving dish like this iced serving bowl (affiliate link) on hand to keep bacteria at bay for hours. Your potato salad will stay chilled and your guests will stay alive! If that type of thing is important to you, of course. Remove potatoes from pot once tender and rinse under cold water to cool. Add mayo, sour cream, Dijon, and vinegar to a large bowl and mix to combine. Add crumbled bacon, blue cheese, and green onions and combine further. Add potatoes and toss to coat evenly. Add pepper and salt to taste. Can serve immediately, but flavors will meld better if left in the fridge overnight. IF YOU LIKED THIS RECIPE you will also love my Classic Macaroni Salad recipe too! This recipe was originally published on FoxValleyFoodie.com April 19, 2016. 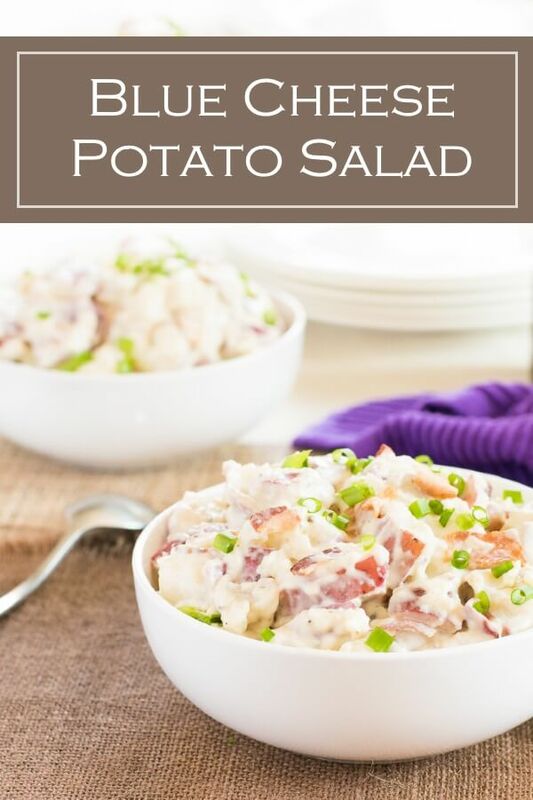 If you enjoyed my Blue Cheese Potato Salad with Bacon recipe then you should probably like me on Facebook and follow me on Pinterest too. That’s what I would do at least, because if you don’t get to know me but you still use my recipe it is kind of like taking candy from a stranger, and your mom taught you not to do that. Don’t disobey your mom, subscribe to Fox Valley Foodie today. I like the way this looks and sounds! Always looking for a recipe to upgrade my potatoes on the side. Loving this recipe, saved for later use. Terrific looking salad, Ben! There is nothing that we don’t love about this one; thanks for sharing and we will be passing this on to our facebook readers as well! Thanks as always for the kind comment, it is always great hearing from you!